The Certified Ophthalmic Assistant (COA) is the entry level core designation designed to start eye care professionals on the path to success. The COA designation confirms an assistant’s knowledge in 19 specific content areas. The COA certification examination is three hours in length and is comprised of 200 scored multiple-choice questions. 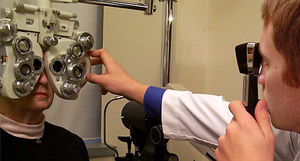 The Certified Ophthalmic Technician is the second core designation level confirming knowledge in 19 specific content areas specifically designed to test the Certified Ophthalmic Assistant or program graduate who intends to advance their career in the eye care field. The COT examination is given in two parts: a multiple-choice examination consisting of 200 scored questions which is three hours in length and a Skill Evaluation consisting of seven skills areas which is two hours in length. 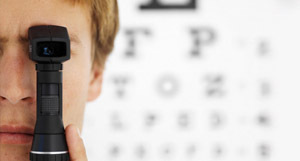 The Certified Ophthalmic Medical Technologist (COMT) certification designation recognizes those individuals who have progressed through the COA and COT levels or are training program graduates as accomplished eye care professionals. The COMT designation confirms knowledge in 17 content areas that the ophthalmic professional seeking the COMT designation performs on a daily basis. The COMT examination is given in two parts: a multiple-choice examination consisting of 160 scored questions which is three hours in length and a Performance Test consisting of five to twelve skill areas. 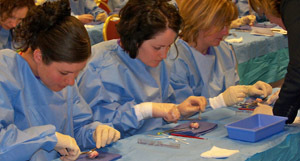 Achievement of the OSA sub-specialty certification exemplifies knowledge in the procedures and instrumentation necessary to assist in ophthalmic surgical suites. Candidates who are interested in obtaining the OSA certification designation must be a COA, COT or COMT certificant in good standing. The OSA examination is one hour in length and is comprised of 75 scored multiple-choice questions. The designation of Registered Ophthalmic Ultrasound Biometrist (ROUB) signifies Allied Ophthalmic Personnel who perform A-Scan biometry of the eye, and have a knowledge base in biometry and physics. No pre-requisite certification is required to sit for the ROUB examination. The ROUB examination is three hours in length and is comprised of 170 scored multiple-choice questions. The designation of Certified Diagnostic Ophthalmic Sonographer (CDOS) signifies Allied Ophthalmic Personnel who have a knowledge base in the principles and instrumentation needed to perform eye examinations using high frequency sound waves and perform B-Scan sonography. 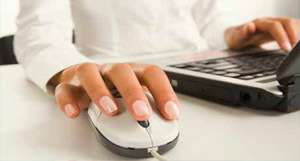 No pre-requisite certification is required to sit for the CDOS examination. The CDOS examination is three hours in length and is comprised of 175 scored multiple-choice questions. 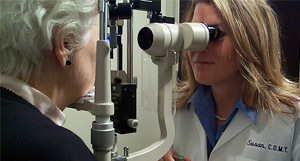 The designation of Corporate Certified Ophthalmic Assistant (CCOA) offers corporate employees of companies that supply products and services to the ophthalmic profession and the recognition that they have the essential knowledge in both ophthalmology and industry technology. The CCOA examination is three hours in length and is comprised of 200 scored multiple-choice questions. The Ophthalmic Scribe Certification (OSC) meets the CMS Rule with its 125-item Ophthalmic Scribe Certification examination and is designed to test the knowledge of creating and maintaining patient medical records under the supervision of an ophthalmologist. These records include the documentation of a comprehensive patient history, physical examination, medications, lab results, and other essential patient information.